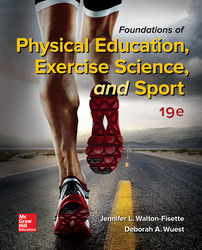 The Nineteenth Edition of Foundations of Physical Education, Exercise Science, and Sport personalizes learning for every student, ensuring that they come to your physical education class confident and prepared with strong coverage of the foundations of motor behavior, biomechanics, exercise physiology, sport and exercise psychology, the sociology of sport, and physical education pedagogy. This enables you to have receptive and active participants in class on their path to diverse careers within physical education, exercise science, and sport. Connect is the only integrated learning system that empowers students by continuously adapting to deliver precisely what they need, when they need it, and how they need it, so that your class time is more engaging and effective. Connect is sold separately and does not come automatically with the purchase of the textbook.